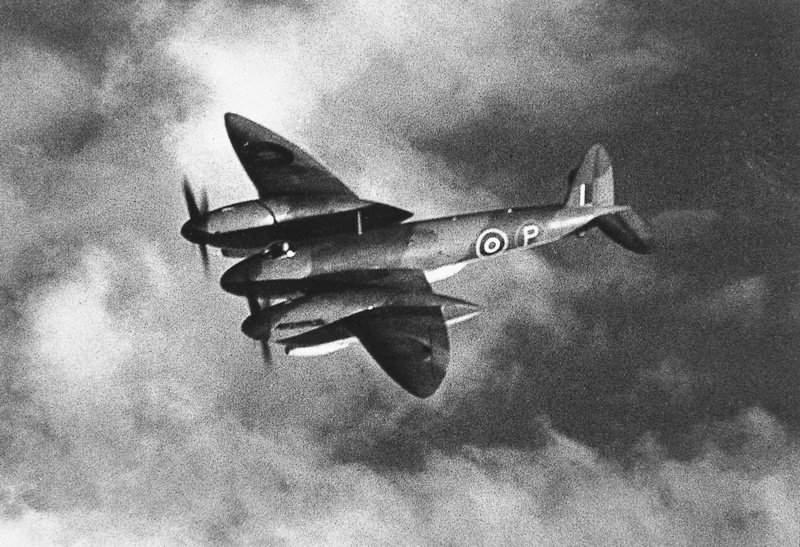 In March 1939, The British Air Ministry issued Specification F.6/39 for a 400 mph (644 km/h) two-seat fighter. The aircraft was to carry four 20-mm cannons, with the possibility of later mounting two 40-mm cannons. Under a design team led by Rex Pierson, Vickers-Armstrongs Ltd. (Vickers) had been working on a fighter with a single flexibly-mounted 40-mm cannon installed in the aircraft’s nose. The twin-engine aircraft was powered by Rolls-Royce Griffon engines and met the requirements of F.6/39, aside from its armament. Vickers met with the Air Ministry in April 1939 to discuss the aircraft’s potential. The Air Ministry was sufficiently impressed and issued Specification F.22/39 that covered the Vickers fighter, which carried the internal designation Type 414. Specification F.6/39 was subsequently cancelled in November 1939. The Vickers Type 432 prototype DZ217 appears shortly after its completion at Foxwarren. The bystander gives some indication to the aircraft’s size. Note the bubble canopy. Two Type 414 prototypes were ordered on 30 August 1939, and they were assigned serial numbers R2436 and R2437. After inspection of the Type 414 mockup in early February, the Air Ministry inquired about the possibility of installing several 20-mm cannons in place of the single 40-mm cannon. Vickers responded with aircraft proposals incorporating eight 20-mm cannons or two 40-mm cannons. Vickers designated the fighter with 20-mm cannons as the Type 420. Two cannons were positioned in the aircraft’s nose, and three were on each side of the cockpit. Vickers and the Air Ministry discussed the Type 420 in June 1940, and Specification F.16/40 was issued for the aircraft’s development. The Type 420 was given a high priority, and an order for two prototypes was expected. The order for two Type 414 prototypes was still in place. However, the Type 420 took precedence, and work on the Type 414 slowed substantially. In early January 1941, the Air Ministry requested a design change to reduce the number of 20-mm cannons to six. At the same time, Vickers had designed a high-altitude fighter that used many components from the Type 420. The high-altitude aircraft was armed with four 20-mm cannons and powered by two Rolls-Royce Merlin engines. The Air Ministry was interested in Vickers’ proposal, as they felt there was an urgent need for a heavily armed, high-altitude fighter aircraft to intercept high-altitude German bombers that were expected in the skies over Britain. However, high-altitude German bombing raids were never undertaken en masse and did not present a significant threat to Britain during World War II. Rear view of the Type 432 displays the aircraft’s long engine nacelles and ventral pod for the six 20-mm cannons. Note how the aircraft’s tail resembles that of a de Havilland Mosquito. 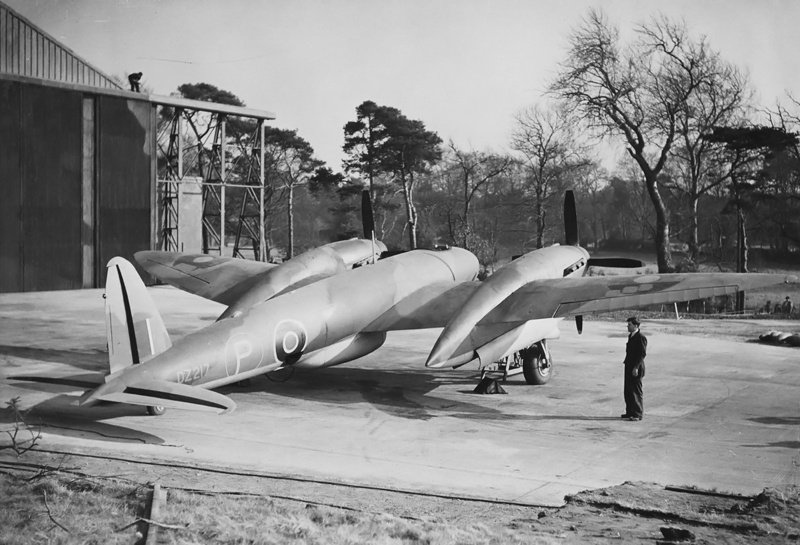 The completed aircraft was disassembled at Foxwarren and taken to Farnborough for flight testing. In March 1941, work on the Type 414 was stopped completely, and discussions with Rolls Royce commenced regarding the acquisition of Merlin engines. In May 1941, Vickers detailed the specifics of the high-altitude aircraft, which it had designated as Type 432. Specification F.22/39 was cancelled, thus halting work on the Type 420. Design work on the Type 432 continued, resulting in the switch to a single-seat cockpit placed in the nose of the aircraft and six 20-mm cannons installed in a ventral fairing. Each cannon had 120 rounds of ammunition. The Air Ministry ordered two Type 432 prototypes on 9 September 1941, and the aircraft would be built to the new Specification F.7/41. The two Type 432 prototypes were issued serial numbers DZ217 and DZ223. The fuselage of the Vickers Type 432 was made of stressed-skin aluminum panels that were flush-riveted to the closely-spaced circular structures that made up the airframe. The forward part of each wing was made of a similar stressed-skin construction. The thick skins and their supports created a torsion box of sufficient strength so that conventional wing spars and ribs were omitted. Fabric covered the aft section of the wings and the aircraft’s control surfaces. The wings had a unique elliptical planform with a slight forward-sweep outside of the engines. The wing leading edges between the engines and fuselage housed the coolant radiators. The aircraft was powered by two-stage, two-speed Merlin 61 engines capable of 1,580 hp (1,178 kW) at 23,500 ft (7,163 m). The engines were housed in long, streamlined nacelles mounted to each wing. The main landing gear retracted rearward into the nacelle behind the engine. The cockpit consisted of a pressure cabin topped by a small canopy that hinged to the side for entry. The Type 432 was a rather large aircraft with a wingspan of 56 ft 10 in (17.3 m), a length of 40 ft 7 in (12.4 m), and a height of 13 ft 9 in (4.9 m). Forecasted top speeds were estimated at 320 mph (515 km/h) at sea level, 435 mph (700 km/h) at 28,000 ft (8,534 m), and 400 mph (644 km/h) at 40,000 ft (12,192 m). Cruise speed was estimated at 400 mph (644 km/h) at 29,500 mph (8,992 m). The aircraft had a 2,750 fpm (14.0 m/s) initial climb rate and a service ceiling of 43,500 ft (13,259 m). The Type 432 weighed 16,373 lb (7,427 kg) empty and had a maximum takeoff weight of 20,168 lb (9,148 kg). With 506 gallons (421 Imp gal / 1,914 L) of fuel, the aircraft had a 1,500 mi (2,414 km) range. During its initial taxiing tests at Farnborough, the Type 432 exhibited tracking issues and snaked from side-to-side. The landing gear was moved aft 3 in (76 mm) to improve handling. Flight tests revealed other undesirable characteristics, and modifications were made to the aircraft’s ailerons and tail to improve its handling. The Type 432 mockup was inspected in late December 1941, and the first prototype, DZ217, was built throughout 1942. The aircraft was built at Foxwarren, a special Vickers dispersal site for experimental work near Brooklands in Surrey, England. The site did not have an airfield, so the Type 432 was disassembled and transported to Royal Aircraft Establishment Farnborough for its first flight. The Type 432 was first flown on 24 December 1942, piloted by Tommy Lucke. On 29 December, the Ministry of Aircraft Production cancelled the partially-built second prototype. This decision was not made official until 1 May 1943. The entire Type 432 program was cancelled at the end of 1943. The sole Type 432 aircraft continued to fly occasionally until November 1944. Some efforts were made throughout the aircraft’s existence to improve its handling and flight qualities, as the Type 432 was noted as having heavy controls. Only 28 flights were made, and the aircraft was never submitted for official trials or tested to its maximum performance. Additionally, the 20-mm armament and the pressurized cabin were never installed. Although the Type 432 exceeded 400 mph (644 km/h) in a slight dive, the highest speed obtained in level flight was 380 mph (612 km/h), recorded on 14 May 1943. One of the factors that limited flight testing was that the Merlin engines installed in the Type 432 did not run well above 23,000 ft (7,010 m). Since the Type 432 had no future as a production aircraft, the performance issues of its Merlins were never fully investigated. Aircraft observers were a regular fixture during World War II, keeping an eye out for any enemy action in the skies over Britain. The rarely-seen and oddly-shaped Type 432 was only listed as “AP1480” in the recognition handbooks. 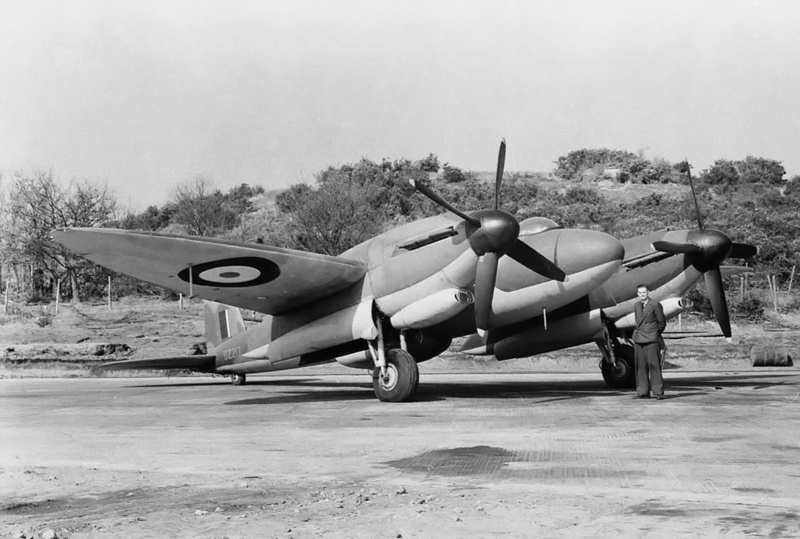 This non-descript designation led the spotters to dub the Type 432 as the “Tin Mossie” on account of the aircraft’s resemblance to the wooden de Haviland Mosquito. Some source list the aircraft as being referred to as “Mayfly,” but the origin of this name has not been found. The Type 432 made only 28 flights in its two-year life. The aircraft was noted as having some handling deficiencies that were never completely resolved, because the project was a dead end. Note the slight forward sweep of the Type 432’s outer wing panels. This entry was posted in Aircraft, World War II on 20 June 2018 by William Pearce.